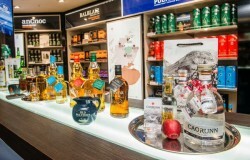 Just as we’re heading up for one of the busiest travel times of the year isn’t it good to know that, if you’re at Edinburgh Airport this Easter weekend, you won’t be far from Gintime fave, Caorunn Gin. Pop into the brand stand and enjoy a fabulous Caorunn and T. And if you haven’t tried the signature red apple garnish chosen to complement Caorunn’s uniquely flavoursome botanical recipe, now’s your chance. Bon voyage!